The Michigan is more or less complete in regards to construction. 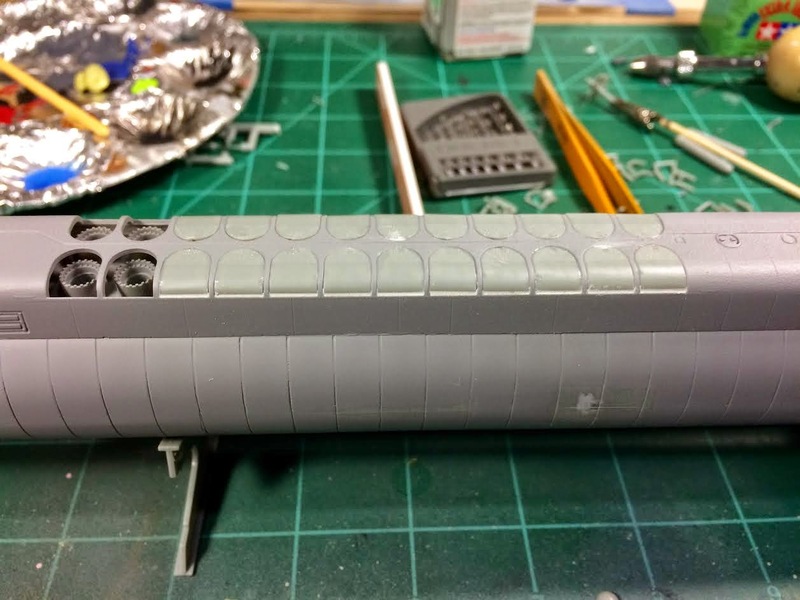 However, I have moved on to the laborious process of priming and sanding to make sure the seam running the length of the hull is completely invisible. So far, this has taken at least four prime-then-sand cycles to complete. Another unexpected surprise was a massive gap on every single closed missile hatch. 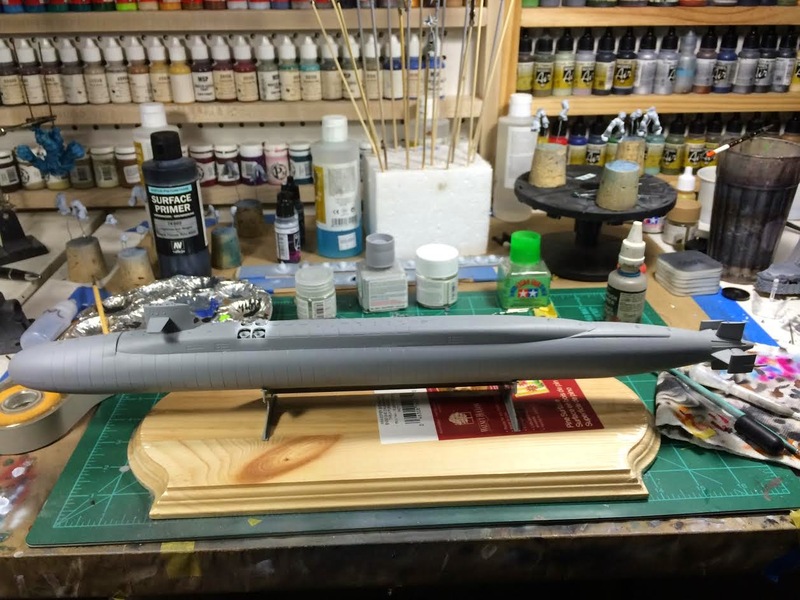 I have see other modeler's builds of this boat and none of them had mentioned this in their write-ups so I'm not sure if this is a typical issue with this kit or only mine. Regardless, I made short work of them with some Vallejo Plastic Putty and some light sanding. After a couple blasts of primer, they were barely noticeable. I would like to get some paint on her sometime this week but I think there is another couple of rounds of sanding left to go before I begin that. While one of my numerous coats of primer was drying, I moved on to pain the tiny helicopter that is supplied with the kit. My client specifically requested the helicopter to be painted as a United States Coast Guard HH-60 Jayhawk. 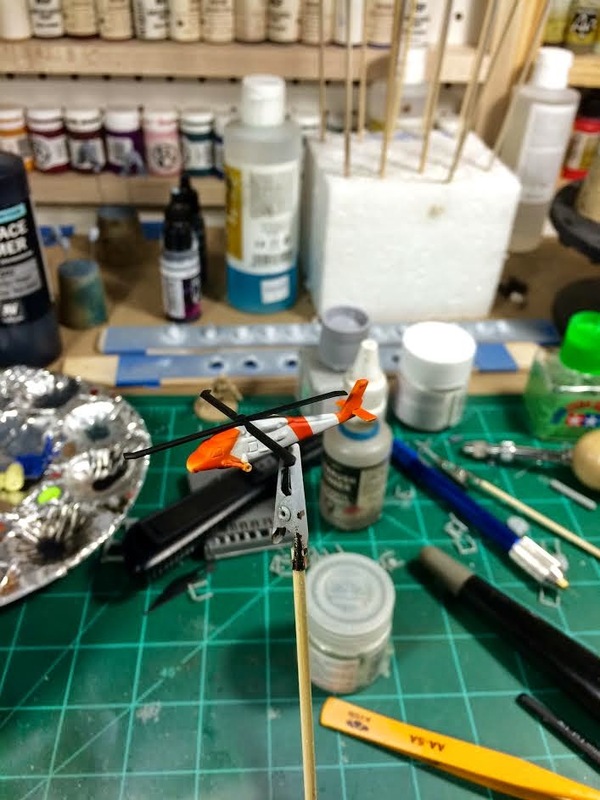 After priming the helicopter, I gave it a base coat of Tamiya Flat White (XF-1) and then painted the orange markings with Vallejo Model Air Orange. I finally tracked down some 1/350 USGC decals after months of searching and while I don't have them in hand yet, I'm hoping they will work for this tiny model. The plastic supports are temporary. The display stand is made from a pinewood plaque and the supports (which I haven't made yet) will be made from pinewood 1"x2" board. I will stain the stand gunstock which should compliment the model nicely. I also ordered a brass nameplate for along with another surprise which I'm sure my client will enjoy.